Property Location Located in Norwood, Backcountry Inn is in the mountains, minutes from San Miguel County Fairgrounds, and close to Norwood Community Garden. This motel is within the vicinity of San Miguel River Canyon.Rooms Make yourself at home in one of the 10 air-conditioned rooms featuring refrigerators and microwaves. 32-inch flat-screen televisions with cable programming provide entertainment, while complimentary wireless Internet access keeps you connected. Private bathrooms with showers feature complimentary toiletries and hair dryers. Conveniences include coffee/tea makers, as well as phones with free local calls.Rec, Spa, Premium Amenities Make use of convenient amenities such as complimentary wireless Internet access, a fireplace in the lobby, and tour/ticket assistance. 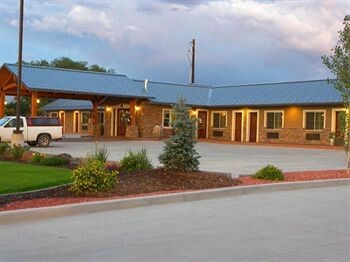 This motel also features a picnic area and barbecue grills.Business, Other Amenities The front desk is staffed during limited hours. Free self parking is available onsite.